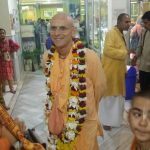 At around 12 noon, Adi Kesava & Bhakta Vatsala left auspicious Vrindavan to fetch Kadamba Kanana Swami from Delhi Airport. He was scheduled to arrive at 14h30 from Dubai after a long 20 hour journey from South Africa. At 15h30 Maharaj appeared through the gate and was received graciously. 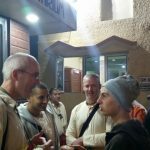 They hopped into the awaiting taxi, luggage and all, and set-off for destination Vrindavan! 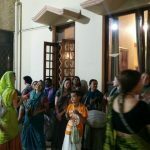 At 6h30pm we were updated that Maharaj would arrive in about 45min, so the chanting continued strongly and it was brought to a crescendo when Maharaj finally arrived. The first stop that Maharaj made was at the house of Prabhupada to pay his obeisances. After that he left for his room in the guesthouse. 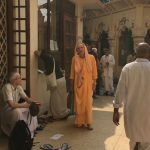 Adi Kesava, Bhakta Vatsala and Uddhava were already inside with the luggage when Maharaj came in, and following him were almost 50 devotees. 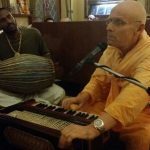 Maharaj said, “Yes, come in come in!” and the room quickly filled up and we were nicely packed together while Maharaj sat on his bed and started a small kirtan. 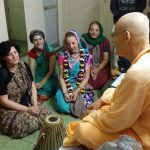 After the intro kirtan he looked upon everyone and commented, “… so nice that you all came.” He made the point that we are all “home” now, Vrindavan is our home, a place to recharge and that we should come at least once a year, like how Prabhupada mentioned to his disciples. After the talk he distributed dried fruit and nuts to a very eager audience and he concluded by thanking us for coming and hinted that he was ready for his dinner and a shower. 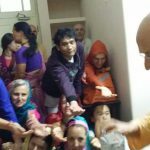 Kadamba Kanana Swami did not leave his room during the first part of the day because of a flood of people all who wanted to meet and talk to him. He spoke to many people including Kyoko who was to be initiated later that afternoon. At 12 noon, finally Maharaj left the guesthouse to take a much needed japa walk. After lunch he started to prepare for the impromptu initiation ceremony that was about to take place. Slowly, devotees gathered in the room and at 4pm everybody was present, except Kyoko. But within a short time Kyoko arrived and the ceremony started. 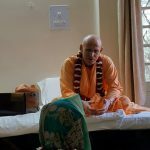 Maharaj started the conversation with a comment about a previous initiation ceremony in a hotel in Switzerland and how it was not possible to have a fire ceremony in the hotel, similarly he could not do one in the ISKCON Guesthouse. He apologised for his inability to organise it elsewhere. But, he said the vows that the disciple promises to follow are just like the fire because they are the essence of the initiation. He continued his short talk on how our vows, especially in the beginning, are based on conviction. And how we, at a later stage, need feelings or inspiration to continue in our service. We need to put our heart in it to stay afloat. He concluded the talk by addressing the occasion of initiation and focused his attention on Kyoko. 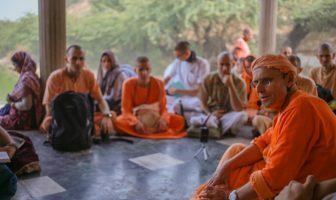 When Maharaj asked what four principles Kyoko will promise to follow for the rest of her life, he followed up by asking how can one be sure that one will follow them for the rest of one’s life! How do we know what will happen to us, so how can we make an eternal promise. 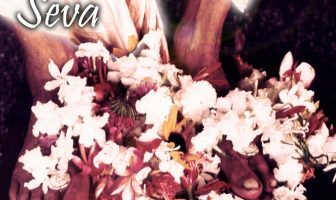 Kyoko expertly answered that all she can do is pray for the mercy of Krsna and the vaisnavas. Maharaj commented that this was the correct answer! 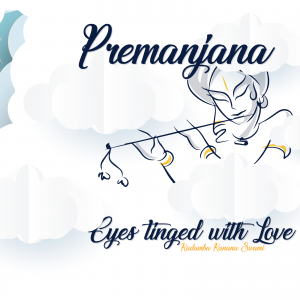 Following the vows, Maharaj increased the tension a bit when he was about to announce the new name. 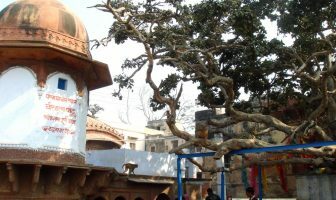 He wanted to give her a name that had Vrindavan in it because actually she got accepted by Maharaj in Vrindavan and now also she received initiation in Vrindavan, so Maharaj thought it proper to give her a name with Vrindavan in it. 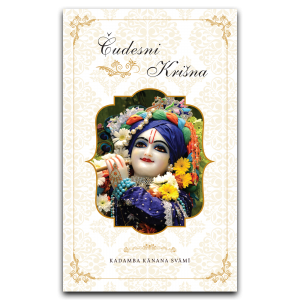 He broke the anticipating atmosphere by announcing her new name: Keli Vrindavan Devi Dasi. 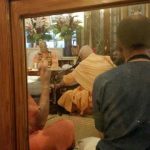 After the program concluded Maharaj already had appointments to meet devotees for darshan but the crowd in his room was not about to move. Maharaj made the funny comment, “Thank you all for coming and now… thank you all for going!” And that concluded the private initiation ceremony. 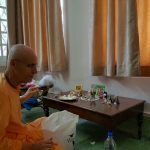 Earlier that morning, Maharaj was invited by the management of Srila Prabhupada’s house to sing the evening bhajans. 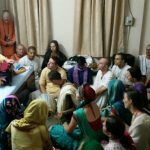 The news spread quickly and already at 18h45 the bedroom of Srila Prabhupada started filling up. When Maharaj entered at 19h10 the room was packed. Maharaj sat down, offered obeisances and started singing the most enlivening bhajans for the next 90 minutes with Gopal expertly playing mrdanga. 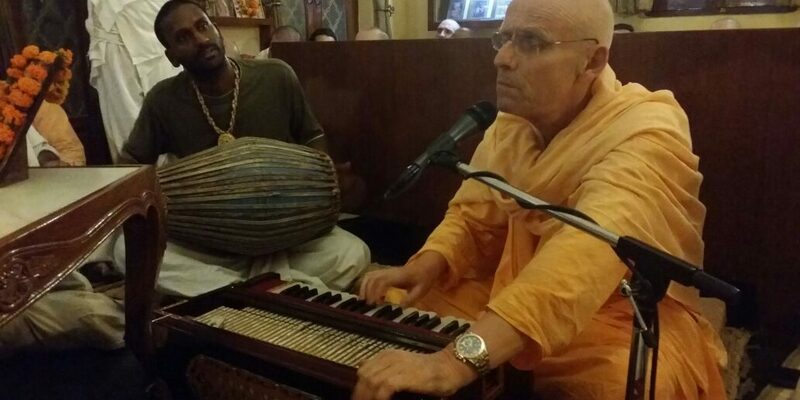 The bhajans were sweet and mellow, and at times Maharaj would give it all and then some! He even got some of the crowd to stand up and dance. For the last half hour, people from outside were looking in to see what was happening and the room got even more packed when Maharaj brought the bhajan session to an end. 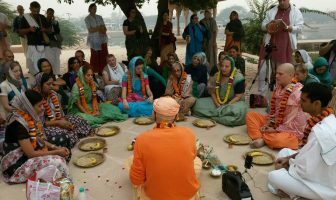 And that concluded the day and devotees left in anticipation for the following day’s festival honouring of Srila Prabhupada’s Disappearance.